In a large, high-sided pot, saute onions in 1 tablespoons olive oil until translucent. Add diced squash, onion flakes, diced apples, then chicken broth. Cover and simmer about 30 minutes. Salt and pepper to taste. Turn heat off, allow to cool for a few minutes, add 1/2 cup cold water. Puree soup directly in the pot with a mixing wand (or you can do this with a blender). It’s ready to serve. About 90 calories per 1 cup serving. Fore a video demonstration of this recipe, CLICK HERE. 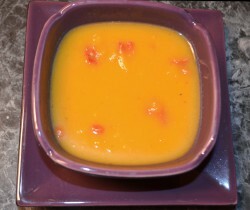 This entry was posted in Cooking Light, recipes, WEIGHT LOSS and tagged Butternut Squash Soup. Bookmark the permalink.